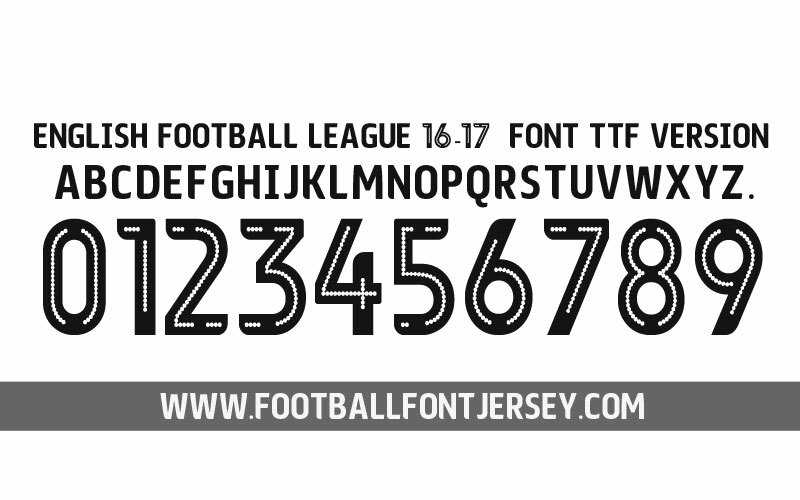 We update for English Football League Font 2016 / 2017 , this font will worn for Championship Division , League One , League Two. Please read carefully before you make purchase , beauce we made two kind of font TTF / OTF and Vector. We dont accept complain about wrong bought font. TTF / OTF format you need instal first before use and can type directly like other font , in this format number DOESN’T HAS logo , we make logo separately on ” : ” and ” ; ” font. This entry was posted in English Premier League and tagged 2016/2017, ENGLISH FOOTBALL LEAGUE, Font, TTF.